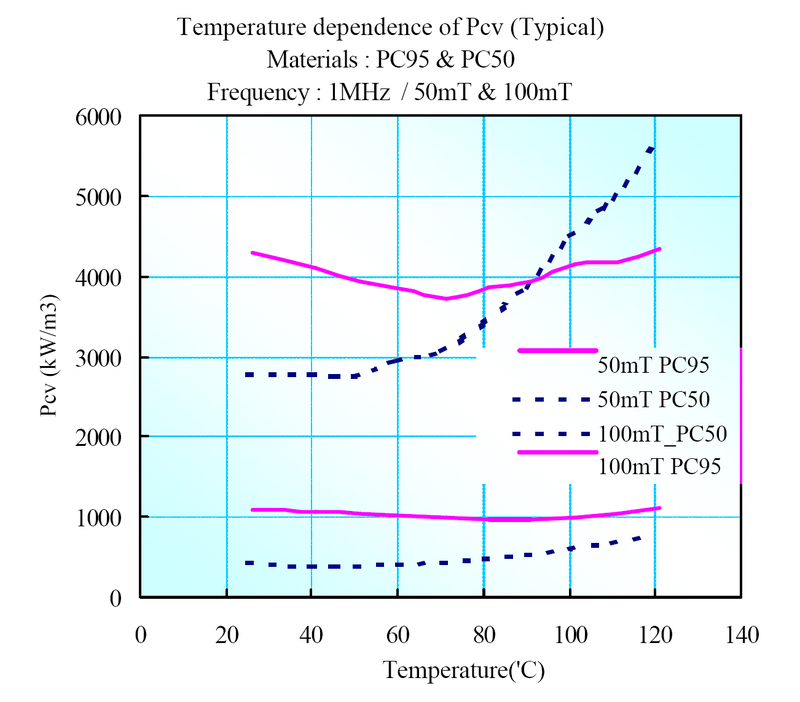 Power Applications Greater Than 400KHz | MH&W International Corp. This indicates that the core loss increases expotentially as the frequency and the flux increase. As a result, the ferrite material for use in the high frequency range above 400KHz must be specfically formulated to control Eddy current losses due to the frequency and the flux. 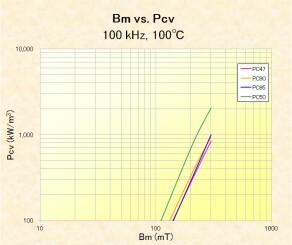 The first materials design for use in this frequency range were the TDK PC50 and the Epcos N49. 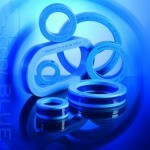 These were design for power applications at high frequency and lower flux densities. Power designs at these frequencies were expected to keep the operating flux densities in the 50mT range. 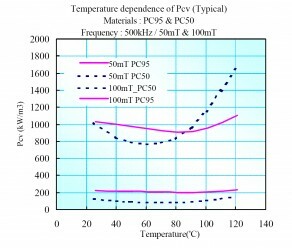 As technologies have progressed, power supply design engineers have been pushing the frequency and the operating flux. 400KHz – 600KHz at 80mT – 120mT are becoming the norm. 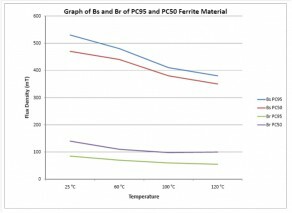 PC50/B49 is no longer the material of choice under these conditions. 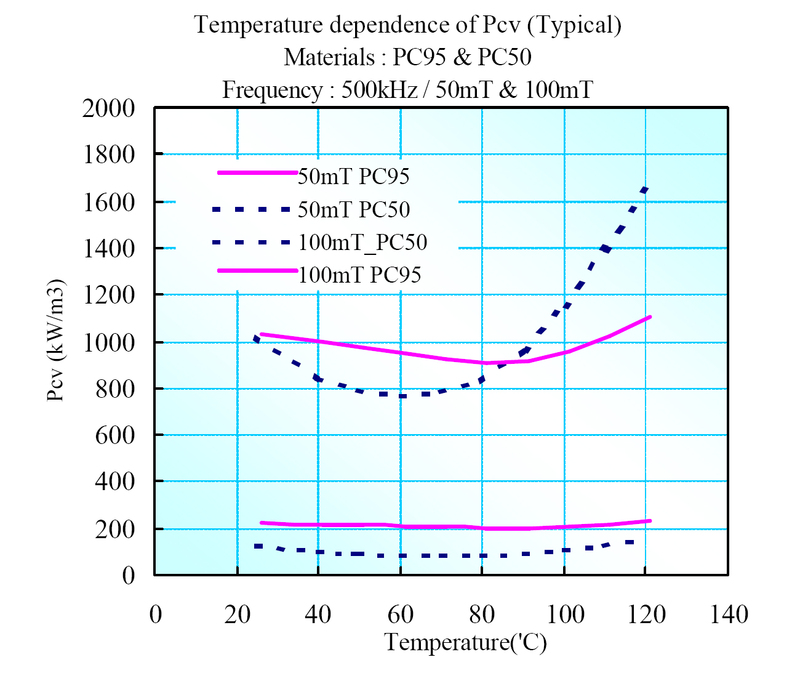 With introduction of the PC95 material, not only do we have a flat core loss curve over temperature, we also have the additional benefit of this new ferrite material of lower losses at high frequencies and higher flux densities. 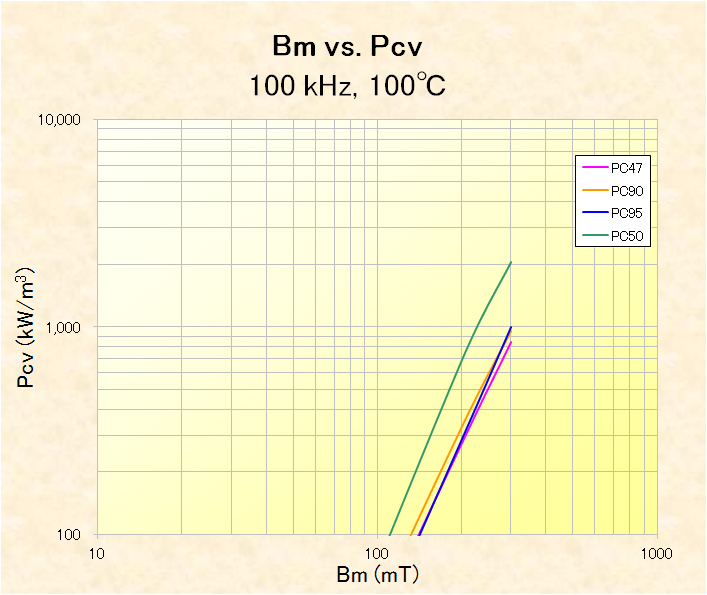 At 100 KHz, PC50/N49 shows higher losses than all the other materials. This is correct in that the material was designed to control Eddy Current losses. To control Eddy Current losses the grain size became smaller and more uniform allowing for a more tightly packed composition. This structure actually increased the hysterisis loss. 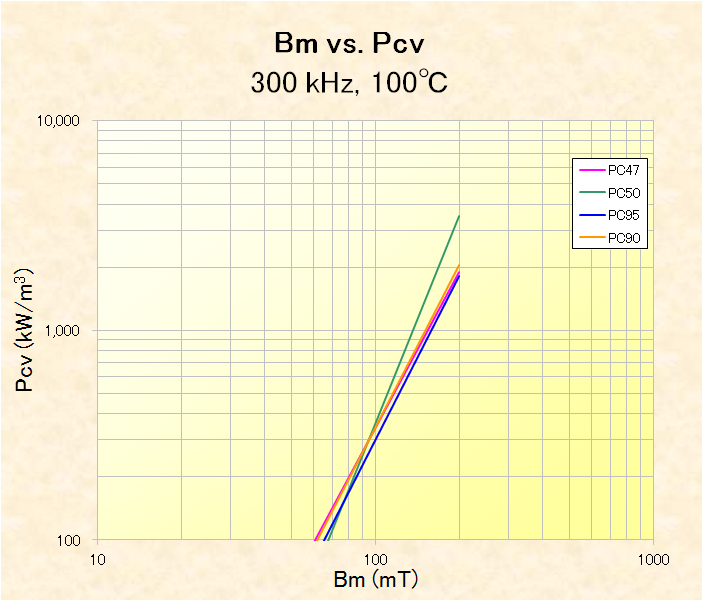 At 300 KHz, we start to see the PC50/N49 material show lower losses than the other materials. The cross-over pooint where the PC95 shows lower losses is 75mT. 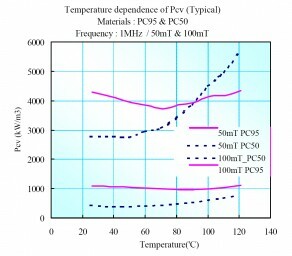 At 500KHz, again we see PC95 becomming a better material where core losses are a concern. 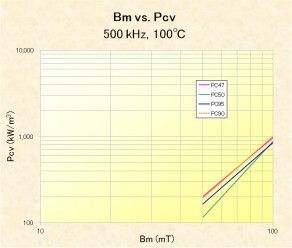 The cross-over point at 500KHz is about 95mT. 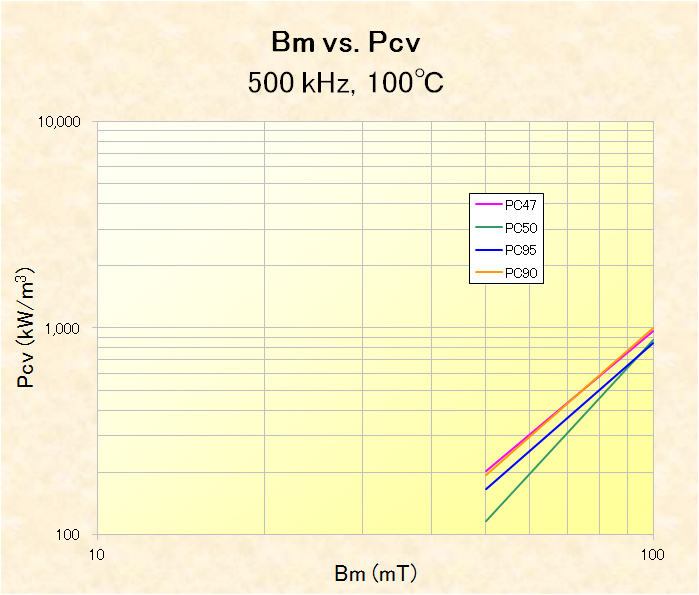 Lets continue looking at the PC50/PC95, specifically at 50mT and 100mT with varying temperature. We now have two additional graphs to look at. The last discussion point is the relationship between Bsat and Br. 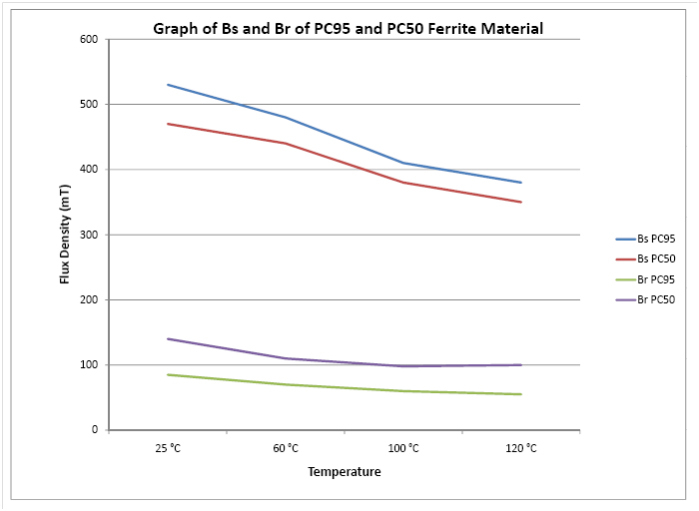 In power topologies where the operating point is in the 1st quadrant, the better ferrite material is the material where the ΔB ( Bsat – Br) is the largest possible over the entire temperature range. 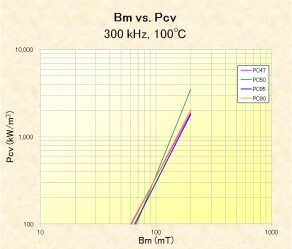 The below graph shows the Bsat and the Br for PC50 and PC95.